Tasty trivia: The Bookmark Café is the only place in MU’s Ellis Library where food may be consumed. Eat here, or risk getting caught by the security personnel who walk around the library on food patrol. The Bookmark Café is one of the secret nooks on the University of Missouri campus where overachievers and procrastinators hunker down when they need to accomplish something. Serving Kaldi’s coffee, pastries and light sandwich fare, this little coffee shop on the ground floor of Ellis Library is the ideal place for students to grab a quick lunch on campus. Tasty trivia: Sure, it’s a food cart, but Mizzou Hot Dogs accepts all major credit and debit cards. Mizzou Hot Dogs isn’t, well, just hot dogs. At night, owner Tim Mallory sets up shop outside of Fieldhouse or Quinton’s around 9 o’clock and serves brats or hot dogs until the bar crowd heads home. Tasty trivia: This former gas station became the first Domino’s franchise in central Missouri, opened in 1980 by Pizza Inc. owner and founder Greg Neichter. A few pizzas and 32 years later, the company now manages 35 Domino’s franchises throughout Missouri and Kentucky, and employs more than 600 people. In the heart of downtown, with its awkwardly shaped parking lot, Domino’s may seem out of place, but the location is perfect for hungry folks who want pizza to go. It’s consistently good and consistently fast. Tasty trivia: The ’Berg gives away about $28,000 a year in free appetizers because of its buy-one-get-one nightly happy hour special. Two weekday happy hours — one from 3:30 to 7 p.m. Monday through Friday and another starting at 10 p.m. — feature drink specials on Long Islands, draft beer and buy-one-get-one appetizers. For the happiest hour, join the revelry at The Heidelberg on Jan. 3, 2013, as it celebrates 50 years of serving cold drinks and hot food to a thriving campus and downtown community. We’ll drink to that. Tasty trivia: Get ‘em while they’re hot! Noodles can be delivered anywhere on the MU campus and to parts of downtown for an additional $2. Your meal will arrive via bicycle. You can travel around the world at this fast, casual spot. Featuring American, Asian and Mediterranean cuisine, Noodles & Co. hits the spot if you like spaghetti but he likes pad Thai. A blend of casual and comforting, this eatery caters to any mood — from quiet business lunch to quick dinner before heading downtown or filling break between classes, it’s all served here. Tasty trivia: In homage to the journalism school, sandwiches are wrapped in faux newspaper. For the caffeine-addicted crowd, the J Café also serves specialty drinks featuring Kaldi’s coffee. Big screen televisions airing CNN and Fox News flash the day’s headlines as customers wait for their coffee at the J Café in the Reynolds Journalism Institute. Fresh fruit, soft cookies and crunchy salads are quickly served to students, professors and the occasional non-Tiger. The café’s red seats are often full, and students don’t give up tables easily; this café always seems to be on deadline. Tasty trivia: In 2010, local chess master Justin Hull sat outside this Chipotle for two weeks and challenged anyone who would play him in a quick game. If he lost, the 26-year-old Hull’s adversary would win a free burrito from Chipotle. Hull awarded a single burrito. Sometimes, a burrito craving just happens. Chipotle offers its solution to the burrito-addicted crowd, fixing made-to-order Mexican fare with a smile. Serving food with integrity, Chipotle features sustainably grown ingredients from the salsa to the steak. Chipotle champions efficiency and caters quickly to the never-ending line. Tasty trivia: The coffee chain features 20 seasonal drinks throughout the year that are constantly revolving and changing. The most popular seasonal beverage, the pumpkin spice latte, is getting a remix this autumn — it’s now available in Frappuccino form. All Starbucks are the same: the green logo, the smells, the sound of the espresso machine, the steady line of customers. What makes the downtown location different is its neighborhood feel — from Greek Week decorations in its windows to the regulars sitting outside. Always-smiling baristas know customer after customer, from the wee hours of the morning until the coffeehouse closes at midnight. Tasty trivia: Which Wich’s write-on-the-bag ordering system sets it apart, but those red Sharpies have a dual purpose. Grab an extra brown paper bag and start drawing — guests are encouraged to decorate a bag and put it on the community wall. Select a category and make selections on a paper sandwich bag with a red Sharpie. That’s the basic idea behind Which Wich, one of the fastest-growing restaurant chains in the country. Missouri has only three, and the Columbia location features 10 categories of ’wiches and five fresh vegetarian options, including a hummus sandwich. Add chips, a freshly made cookie and a drink to your meal and you’re set. During weekday lunch hours, expect a line and limited seating options, as this is a popular spot with the college crowd. Tasty trivia: There are eight Ingredient locations across the Midwest, all of which serve dishes based on an elaborate, 75-ingredient menu. Columbia’s location, however, does not serve many pizzas, a staple of the franchise. Instead, the downtown restaurant’s best-selling item is its freshly grilled burger. Tasty trivia: Campus Bar & Grill had an identity crisis in 2000. 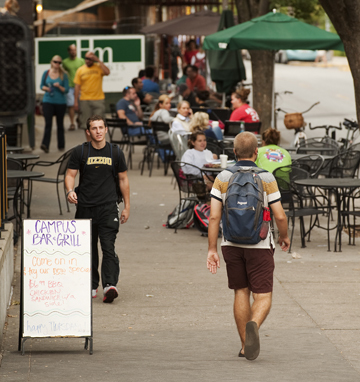 At the time, the bar was sporting its new moniker of Big 12 Campus Bar & Grill, a change from its original name of Sudsuckers. When the Big 12 Conference threatened litigation in 2004, the restaurant changed its name again. The rooftop patio of Campus Bar & Grill has seen many a good time. With beer on tap, nightly drink specials and plenty of burgers to spare on Sunday afternoons, people have been stopping by and drinking up for many years. Serving salads, wraps and a daily lunch special with a healthy side of Mizzou spirit, the place can get a bit rowdy on game days. Tasty trivia: The original of three Shakespeare’s locations in Columbia, this CoMo staple is actually two adjoining buildings. The space behind the main restaurant, which serves as the restaurant’s second backup kitchen (according to General Manager Kurt Mirtsching), was originally a laundromat. Shakespeare’s is vintage CoMo. Serving pizza made with provolone cheese, heaped with ingredients and accompanied by Coke or Pepsi products, this local pizza place has been doing whatever it wants for almost 40 years. Newly renovated bathrooms at this location and newer porcelain signs have spruced up the space a bit, but the character of the wooden booths and brick arches remain as constant as always. And always will be. Tasty trivia: Back in 1927, the original plan for the Missouri Theatre included a high-end hotel on top of the theater. The owners of the Tiger Hotel, then under construction on Eighth Street, raised concerns about the two hotels competing against each other. The plans eventually fell through in the economic collapse of the Great Depression. Depending on the show, the Missouri Theatre concession stand serves popcorn, candy, dessert bites, chips, hummus and pita. The variety of food served is at the discretion of University Club catering and is available only briefly before performances and during events. To try anything from this historic theater’s concessions, however, patrons must have a ticket to the evening’s performance. Tasty trivia: Not only is frozen yogurt generally better for you with one-third the calories of custard and ice cream, the live cultures in yogurt can also boost immune systems and help prevent digestive-tract infections. Yogoluv yogurt is also kosher. The best things in life involve lots of toppings and plenty of options. Yogoluv aims to please with a variety of rotating yogurt flavors and toppings, including chocolate, cake pieces and gummy bears. Keep it healthy with vanilla yogurt and seasonal fresh fruit, or pile the good stuff on with peanut butter yogurt and crushed-up candy bars. Regardless of guests’ selections, yogurt is priced by the ounce so the cost depends on the final weight of each dessert. Tasty trivia: Quinton’s rooftop patio is the only patio of its kind in the state of Missouri. Featuring three full bars on three stories and skyline views of downtown Columbia, it might be the best place to watch the sunset in the heart of the city. Quinton’s 20-some sandwiches are a little different, but they have a lot of personality. Try a Grilled Peanut Butter & Jelly or the Spam-wich that really does feature Spam, or stick with a classic Plain Jane, turkey-and-cheese variety. The music is familiar, the game is always on downstairs, and the staff is always accommodating to any size crowd. If you just can’t get enough, check out Quinton’s after sunset when it transforms into the nighttime playground of Columbia’s trendiest. Tasty trivia: This building housed the original Ford dealership in town, Columbia Automotive. During the Depression, Piggly Wiggly grocery store became the second occupant; from 1973 to 2007, the building was home to Columbia Billiards. The smell is fantastic. The music is charmed. The ceilings are original. The Rome blends a formal dining experience with Italian food made from co-owner Dan Colace’s family recipes, all conducted under the watchful eye of a diligent but friendly wait staff. The Rome also is one of the few places downtown that can cater to extra-large groups, taking reservations for family-style meals for up to 120 guests — with advance notice, of course. And because it seems to truly care about the families it serves, The Rome often lets kids eat free and always offers gluten-free and vegetarian menu options. Tasty trivia: The best part of wine is the variety, and Top Ten Wines has plenty of that. This oenophile’s paradise also sells a wide range of regional and international beer six-packs, located in the back of the store. Wine snobs already know about Top Ten Wines, or at least they should. Owner Paul Vernon stocks 2,500 bottles of local and international wines for sale and conducts dozens of wine tastings throughout the year. Vernon is usually on hand to answer questions, make suggestions for a new bottle and, if you’re new to the uncorked crowd, explain exactly what pinot noir means. Tasty trivia: Historic photos of Mizzou athletic teams decorate the walls surrounding Booches’ trio of pool tables. The photos, donated by MU, showcase Tiger teams that competed for the university more than a century ago. Foodies have flocked here to try what USA Today declared one of the best cheeseburgers in the nation in 2000, but for locals Booches has always been a favorite. Founded in 1884, the restaurant is downtown’s oldest eatery. With pool-hall character and snarky signage, Booches is classically Columbian. The bar is more relaxed and the restaurant more family-friendly than in the past, but just remember to bring cash. Steeped in tradition, Booches doesn’t accept credit or debit cards. Tasty trivia: Panera is located in the Hall Theater, built by T.C. Hall in 1916. The historic setting makes this Panera a little different from its strip mall counterparts, but it offers the same chocolate chip bagel and iced coffee that keep Panera lovers coming back for more. The booths by the front windows provide cozy people-watching nooks to indulge in sandwiches and soup made to order. This modern café chain, originating from St. Louis, features free Wi-Fi and baked treats, as well as fresh-baked bread and handcrafted salads. Tasty trivia: Hey, night owls: This location is open until 2 a.m. on Fridays and Saturdays. Get a 6-inch sandwich for $2.50 from 10 p.m. to 2 a.m. Subway provides a bit of continuity in an ever-changing downtown. The customer service is consistently fast, and sandwich artists manage long lines with ease and efficiency. What sets this downtown Subway apart are the two tall tables by the front windows that face Ninth and Cherry streets, providing a handy perch for people-watching locals. Tasty trivia: Featuring a community wall covered in fliers and comfy booths and couches, Kaldi’s (one of seven in the Midwest) is a cozy spot to sip and socialize. Even the sparking chandelier hanging near the back doesn’t deter from the restaurant’s comfortable and casual feel. Kaldi’s is the kind of place Columbians can spend hours doing nothing at all or having a productive working lunch. Light sandwiches, grilled paninis, crispy salads and made-from-scratch crepes are served on white plates and accompanied with real silverware. Guests who want to take their coffee experience to the next level can attend free events to learn how Kaldi’s signature coffee is made. Tasty Trivia: Mustard Seed, which occupies Ninth Street Video’s old home, still receives the occasional movie poster in the mail and people attempting to return VHS tapes. Columbia’s fair-trade headquarters is the place to shop in an educated and empowered environment. A nonprofit, the Mustard Seed is staffed by volunteers who help customers know that their purchases are socially responsible and sustainable. The shop primarily sells handcrafted jewelry, scarves, bowls and shoes produced by local and global artisans. A select group of Mustard Seed’s fair-trade vendors also produce food items, including Divine Chocolate and jams from Eswanti Kitchen. Local Patric Chocolate is also a popular item. Tasty trivia: Main Squeeze features the only exclusively vegetarian kitchen in town; much of the seasonal produce comes from owner Leigh Lockhart’s quarter-acre garden. A vegetarian’s delight, Main Squeeze offers full-flavored, meat-free dishes (many of them vegan) to a hungry Columbia crowd. All food at the restaurant is natural, and 80 percent of ingredients are organic. The kitchen doesn’t have a microwave or deep fryer; meal preparation is as simple as possible. The natural café also composts all food waste (which Lockhart uses in her garden). Tasty trivia: Known primarily for its Mediterranean cuisine, International Cafe also serves Arabic coffee and a large variety of Middle Eastern desserts to sweeten the end of a satisfying meal. Serving a soup of the day and Mediterranean fare, the International Cafe is always bustling with regulars and diners out to try something different. The cafe’s diverse menu and affordable prices make it simple to travel a world away with spices and flavors originally found on the coast of the Mediterranean Sea. Falafel, babaganush and dolmathes are dishes difficult for some to pronounce, but the wait staff easily deciphers botched attempts and quickly delivers food to cozy tables or the outdoor patio. Tasty trivia: Lakota strives to be all things Columbia. Owner Skip DuCharme features and sells local art on his walls (at no cost to the artists). Displays rotate throughout the year. More than 40 types of coffee are served at this downtown coffee haven. Lakota roasts coffee daily with The San Franciscan, a roaster that resembles a train. Sandwiches, pastries and specialty coffees are made to order and affordably priced. 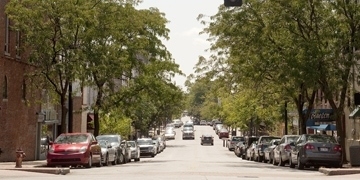 Customers — most of them regulars — are encouraged to relax in Old Hickory furniture and come back for more, day after day. Tasty trivia: Tea might not be the most popular drink on the block, but it can be prepared in dozens of ways — surely there’s one for you. 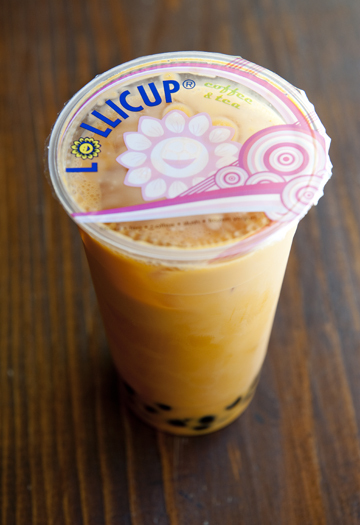 More than 100 different drinks make up the impressive menu at Lollicup, and employees are willing to answer questions regarding the more exotic concoctions (snow, milk slush and boba tea). If coffee isn’t a Columbian’s cup of tea, Lollicup certainly is. Tea options range from basic iced tea to slush or smoothies that feature tea produced all across the world. If you’re hungry, pair your drink with a made-to-order crepe. Tasty trivia: Sparky’s was named for owner Scott Southwick’s bulldog, Sparky. The look-alike statue out front is the shop’s third mascot (two have been stolen since the ice cream parlor opened in 2003). Sparky’s décor might not give off an air of sophistication, but this shop is serious about its ice cream. Flavors, which are selected and made daily by employees, range from traditional chocolate and vanilla to more unusual offerings such as lavender honey or white licorice. For a tipsy taste, Sparky’s adult ice cream creations feature at least one of nine types of alcohol (IDs required). Tasty trivia: Featuring exhibits of local artists, Tellers offers a bit of culture with its cuisine at this restaurant, which is technically on Broadway but certainly has a presence on Ninth Street, thanks to large east-facing windows. Tellers is an American restaurant that blends the sophistication of an art gallery with the charm of a restaurant that serves up succulent steaks and fresh sea food. Tellers also features an outdoor patio on the corner of Ninth and Broadway where guests take in The District’s sights and smells. During winter, opt for a seat by the large windows offering panoramic views of downtown. Any time of year, stop by for Sunday brunch, which features mimosa specials all day. Tasty trivia: Coffee Zone is more exotic restaurant than coffee shop, thanks to a vast menu and bazaar-like ambience. Each of the lamps in Coffee Zone was imported from Morocco, and owner Osama Yanis has decorated his eatery with items he purchased on trips to Jordan. Whether you’re a Web surfer in search of free Wi-Fi or a black-coffee addict who likes to people watch, you’ll fit right in at the friendly Mediterranean coffeehouse. A seat by the large front window is a delightful spot for sipping a Vietnamese coffee while gazing out on Ninth Street. Or, cozy up with a good book and gigantic gyro — the guys behind the counter claim their grilled lamb sandwiches are the best in town. Tasty trivia: The menu at Trey is seasonal, so the offerings change from winter to summer. All food is made with local produce and ingredients, so owner Trey Quinlan’s cuisine depends on what his garden yields and what nearby farmers provide. A rustic, charming atmosphere frames this fine dining experience. Families will enjoy delicately prepared dishes in a restaurant that is formal but not stifling. This new American bistro, which opened in late August, features a menu that constantly changes to highlight the area’s freshest seasonal produce. The attentive wait staff is happy to recommend wine pairings for each dish — or select a funky cocktail such as the Banana Boat, a creamy concoction of banana rum, Irish cream and coffee liqueur. Cheers! Tasty trivia: “Kui,” pronounced q, means grilled meat in Korean. KUI grills its meat over oak charcoal and features a Korean-inspired interior, complete with authentic “bal” blinds that block the sun from shining through its two large windows facing Ninth Street. For an exotic afternoon of smoked meat and delicious Asian cuisine, step into KUI and be transported to Korea. This Asian restaurant features a variety of traditional dishes, including “Bulgogi,” marinated tender beef served with rice and vegetables, and “Dakgalbi,” a sweet and spicy chicken dish. The wait staff is patient and happy to answer any questions for any Korean cuisine novice. Our advice? Everything is better with soju. Tasty trivia: This barbecue joint is ranked No. 2 on Columbia’s Urbanspoon, a website that allows foodies to rate their restaurant experiences to develop an approval rate percentage for eateries. 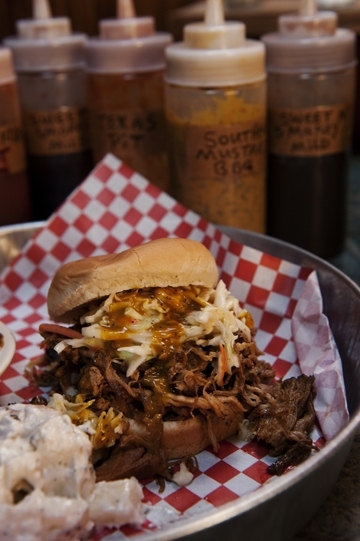 The folks at Shotgun Pete’s must be doing something right; their rating is 97 percent. It’s just good barbecue. That’s the best way to describe Shotgun Pete’s, which moved from a shack on Business Loop 70 into the old 9th Street Deli location in September. Serving five homemade barbecue sauces and grilling up some of the best barbecue in town, Shotgun Pete’s takes a no-nonsense approach to selling tender pulled pork, juicy spare ribs and delicious half-pound burgers. The wait staff and grill masters take their food very seriously, but the Shotgun Pete’s dining experience remains casual and down-home. Tasty trivia: La Siesta owners Benjamin and Francisco Guillen are originally from Cerano, a small town in Mexico. Francisco used to work at El Jimador off of Clark Lane and would ask customers what they thought of their meals. Diners would reply that they needed a nap because they were so full. He decided that if he opened his own restaurant, he would name it “La Siesta,” which means “nap” in Spanish. Serving authentic Mexican on the northern edge of downtown, La Siesta serves spicy entrées quickly and effortlessly. Waiters keep the margaritas coming for a late dinner, serve endless rounds of chips and salsa, and take photos of birthday boys and girls in sombreros and put them on the restaurant’s Facebook page. Authentic Mexican dishes abound, but if jalapeños and hot sauce make you cry, stick to neutral staples such as rice, beans and tacos, which are never out of stock. Muy delicioso! Continue the conversation on Twitter: #ICfood.